Lum & Abner aspire to open a moving picture theater in Pine Ridge. In order to make their dream a reality, they'll need to find an appropriate building in town, a piano (and someone to play it), plus a projector (and someone to operate it). Will the boys manage to pull this project together? Will they find the money for the startup costs? And will Squire Skimp find a way to horn in on their new business? Come on down to the Jot 'Em Down Store and find out! 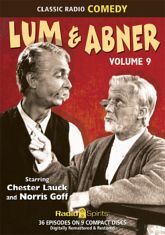 Chester Lauck and Norris Goff star in 36 consecutive episodes from the fall of 1943.